One Cartridge, Not a Box ! . 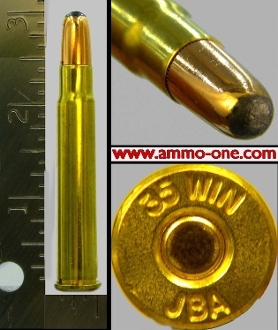 35 Winchester, new production by P.C.I. using JBA brass cases with “35 WIN JBA” Head-Stamp and loaded with a 200grain JSP Hornady Round Noise Jacketed Soft Point) projectile. Sold as a collectible no returns! The .35 Winchester cartridge was introduced in 1903 for the Model 1895 Winchester lever-action rifle, and was later chambered in the Remington-Lee bolt-action rifle. The .35 Winchester was more powerful then the .33 winchester, but because it was less powerful then the 348 and 358 Winchester it was discontinued in 1936. This cartridge has been obsolete since the early 1940's (accept for a special run in 2017), and for some reason, split necks on the case are very common in the older ammunition.